Preheat oven to 400 degrees. Coat 4 cups in muffin tin with 3-inch cavities with cooking spray, and set aside. Break 1 egg into small bowl, then slip into one bread cup. Repeat with remaining eggs. Season with salt and pepper. Cut 4 thin slices from center of tomato, reserving rest for another use. Cover each egg with tomato slice and sprinkle with 1 tablespoon cheese. Set muffin tin in oven and fill empty cavities in tin halfway with water. Bake 15 to 20 minutes, or until eggs are set to your taste and bread tips are browned. 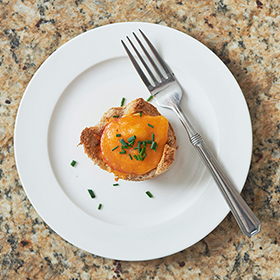 Run thin knife around outside of each baked egg nest, then lift it with tongs, garnish with chives, and serve on plate or in small bowl. Serving size: 1 egg nest. Amount per serving: 177 calories, 8.5g total fat (3g saturated fat), 14g carbohydrates, 11g protein, 2g dietary fiber, 263mg sodium.